Man kids can get underfoot! I happily waved them off this morning, back to school after two weeks and sat down to the computer without anyone whining that it must be their turn! The Teenager has provided much of the fodder for this post. I got up one morning to find this on my desk. He'd been asking for days, so this was pretty polite, so I fixed his jeans. Then there was his other request, "Mum, can you make a mask like a balaclava with no eye or mouth holes?" (He was asking if I was able, before asking if I would!) "Um, yes, WHY?!" For a photography project involving a doll which comes to life. The doll has no features so the person playing the doll-come-to-life needs a mask of no features. I haven't made the actual mask, but have worked up a toile - I'll post the details when I've made the mask! 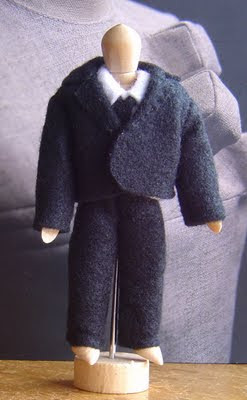 Which led to his next request - could I please make a tiny suit for the doll which was to come to life. He told me his photography teacher had those poseable artists' dolls which he could borrow, and would bring one home for me to dress. 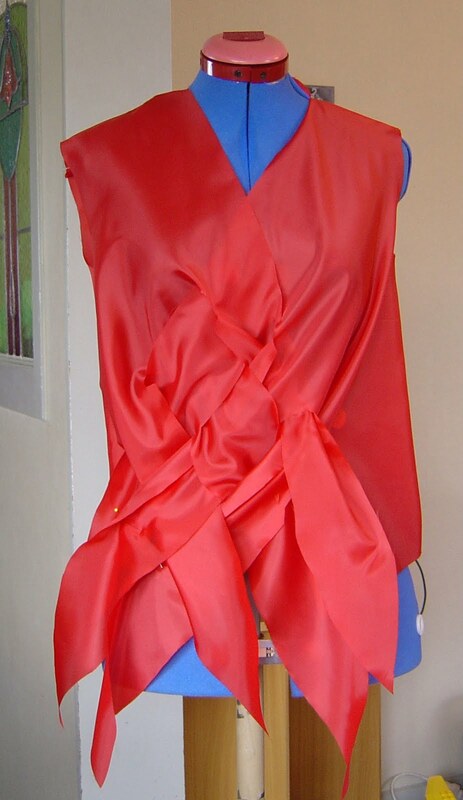 I thought I could just alter Barbie clothes patterns and it'd be fiddly but doable. 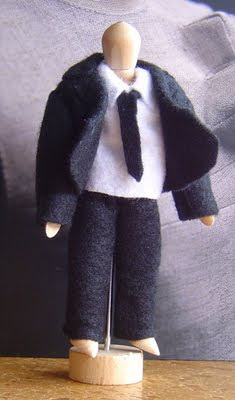 Till he brought home the doll and I realised that it is 12cm tall. Instead of slightly enlarging Barbie patterns I had to scale them to 50% of their original size and then modify them a bit for use. Holy Cow that boy owes me big!!! I used acrylic craft felt because I figured it'd be easiest to use. 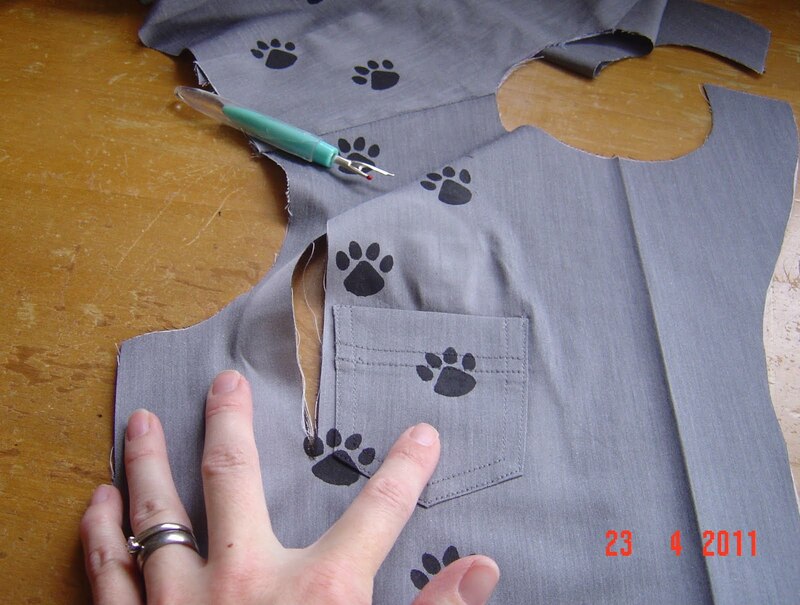 It was easy to use, but I still had to sew all those teeny tiny seams by hand. It's not even close to perfect, but it is good enough. And I am NOT doing another one!!!!! The Teenager is perfectly happy with the suit and admits that I'm the Best Mum In The World. Eagle eyed readers may have noticed my back drop: I chanced upon it on Book Depository for GBP9.75!!!!! (It's now GBP12.88, which is still a great price, especially since they have free shipping worldwide) I ordered it as fast as I could get my credit card out of my wallet. (And then sheepishly phone the bank to activate the card, which I've had for several months, which shows how often I use it) It arrived in under two weeks (Easter was in there, so that was pretty good time!) and to my delight, it's even the English version! Happy happy happy. (The photo on the site doesn't have the "now in English" sticker on the cover, so I was expecting Japanese) I um, also ordered Pattern Magic 2 on Saturday when I noticed the price was no longer GBP19.95 but GBP12.88. Fingers crossed for the English version! I just noticed it's back at GBP19.95 today, so this is presumably something to watch for. I forgot to set my dummy to my size, so it hangs awkwardly. But you get the idea. When I make it for real I'll model it myself. To my utter astonishment when I made a toile of the basic bodice block from the book (with nothing altered except for adding 3cm to the length) it fit perfectly! I actually said WTF? (not abbreviated) when I tried it on. I did have to make the largest size, but apparently I'm proportioned like a Japanese woman. Sadly the modified version of this block (which was to be manipulated into the design) didn't fit perfectly, but required only minor alterations before I could start the hack-and-slash, I mean pattern manipulation. And swore again. And tried to be grateful that at least I could remove and replace the panel, and even salvage the pocket. To finish this rather all-over-the-place post, a story about the Teenager. Once a month or so he has three or four friends over for an overnight computer game session. They all bring their computers, network them together and proceed to kill each other all night. They traditionally eat pizza and chips, but last time decided to get chicken nuggets, wrap them in bacon, batter and deep fry them. This was a huge success, and the Teenager has decided that deep-frying is the best. So occasionally I get up in the morning to discover evidence (reasonably well cleaned up) that he's had a deep-fried snack overnight. One morning I got up to find three battered and fried discs on a plate in the fridge. I couldn't work out what they were (and wasn't game to try one!) so waited till the Teenager got up and asked him. The answer? Biscuits (cookies). I asked why he'd battered and fried biscuits and the reply was that he'd had batter left over after he'd made a jam sandwich, spread nutella (chocolate and hazelnut spread) all over it and covered it it batter before deep frying it. I think cinnamon and sugar came into it somewhere as well. My, my, experimental cooking. That is very funny! 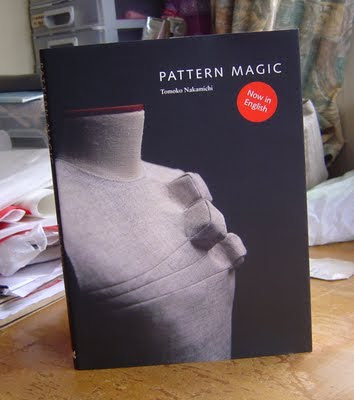 I impulsively bought Pattern Magic II when I found it in English for about US$12, but can't find the 1st version in English for a good price here. Luckily my library has it. But I'm amazed at your red toile. It's gorgeous and I've been drooling over that pattern for a while without the time or brain capacity to work it up. You beat me to it! I can't wait to see the final version.